Aahhh, I really love unboxing because you can build up suspense! Not that these things aren’t cool, but guys… Just you wait! This box was filled with incredible things and this is just the beginning! On the left: a sugar scrub soap by GeekyClean! But more on that later. In the middle photo, we obviously have the content/spoiler card, so read at your own risk! Finally, we have a flag on the right! It’s a quote from one of the Grisha books (and I kept thinking “why does this sound familiar? !” hehe…) There’s a typo, but we’re getting a replacement so I’m just gonna tell you guys here that Fairyloot is the absolute best. I hadn’t even realised there was a typo when I got the email and I actually had to search for it! 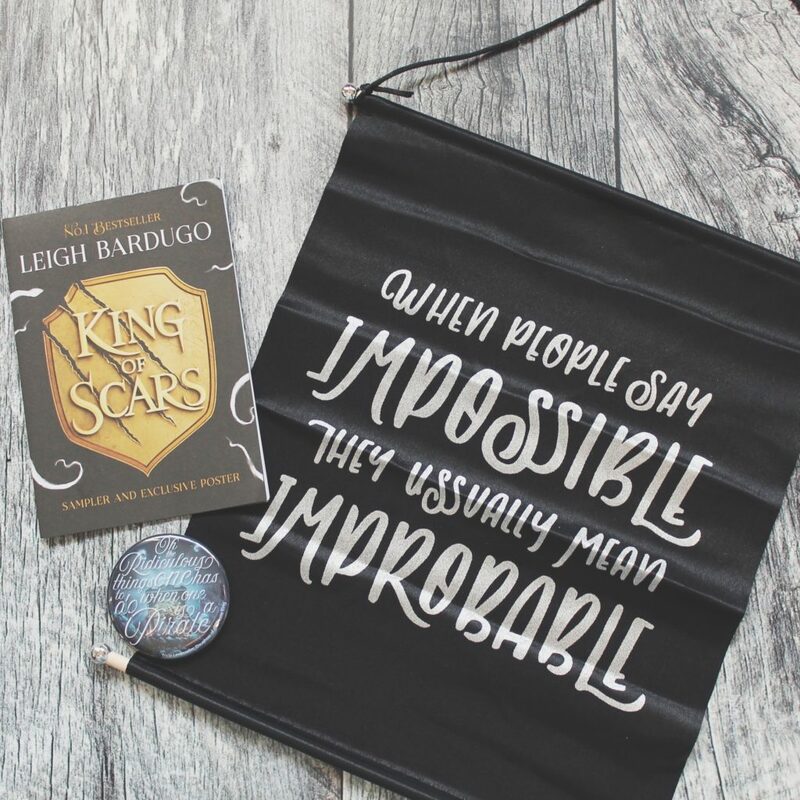 Anyway, the round thingy is a magnet with a quote from Daughter of the Pirate King by Tricia Levenseller, and there’s a King of Scars sampler by Leigh Bardugo which has a cool poster on the back! I already cannot wait to read it. 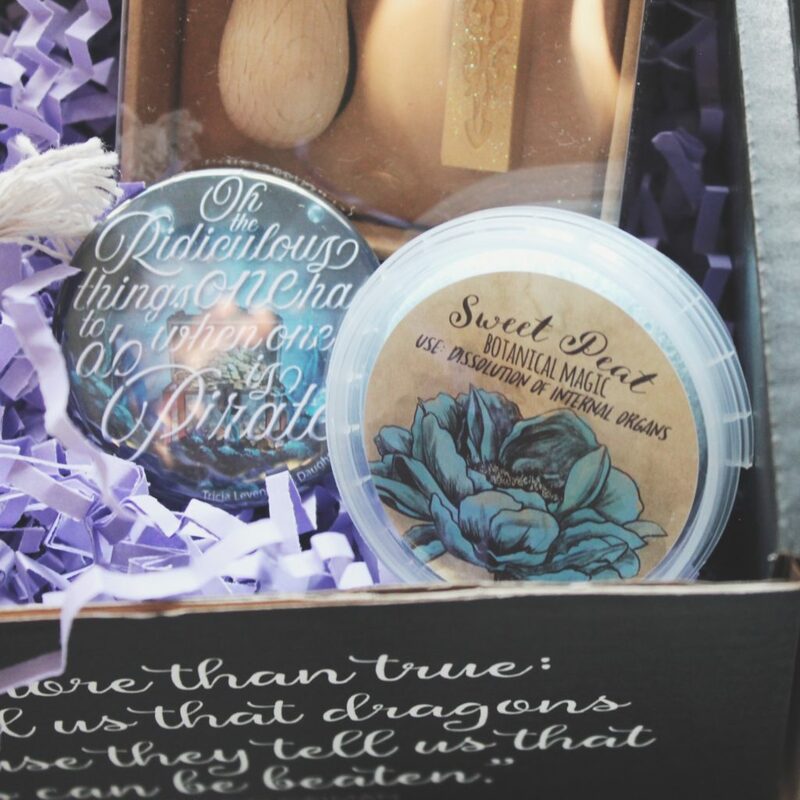 Every Fairyloot box I’ve gotten so far has had a candle, and I honestly don’t mind. I’m candle-obsessed so it’s pretty much the perfect item to include! However, I’m still not sure I like the scent or not. It goes perfectly well with the theme, as it’s a blend of sea mist and musk. But I guess I’m not sure if it’s the right scent for me. I haven’t burned it yet, though. So maybe I’ll still end up loving it! Also, it’s inspired by To Kill A Kingdom by Alexandra Christo and I can’t wait to reread the book while burning the candle! They also included a water bottle! And, oh my goodness, I love it so much! It says “Why is the rum always gone?” which is apparently from Pirates of the Carribean. I love reusable water bottles and I’m starting to grow quite a collection! Since I’ve been using my fave 600ml bottle a lot, it’s nice to have a new 500ml bottle as well. Finally, there’s the scrub I mentioned earlier! It’s a sugar scrub soap created by GeekyClean and it smells like cherry blossoms. It’s a bit of a heavy smell when I open the container, but I’ve used it once and it was wonderful! I struggled to get it out of the container a bit as it’s quite hard/dense but it’s pretty good stuff. I’d been looking for a hand scrub for a while now, and I think I might just use this one, as I don’t really use scrubs under the shower. Also, I love how it’s called “Sweet Peat” but that’s all I’m saying. It’s a These Rebel Waves thing! Oh my goodness, this might just be the most epic thing ever?! It’s a Pirate Wax Seal! Although I also have to be honest that I have no clue when I’d be using this. Like, I don’t want it gathering dust in my desk drawer, but I literally have nothing to use this on? Also, I honestly don’t care; I love it too much for that. I haven’t had time yet to look up the instructions and the wax candle thingy looks a bit scary to someone who’s afraid of fires, but I’ll make it work somehow! *Drumroll…* The book of the month is These Rebel Waves by Sara Raasch! When I ordered the box way back when I was on holiday with my family (yep, dedication!) I was 99% sure this would be in it and I’m so glad I was right because oh my goodness, I’m just so incredibly excited about this book! I haven’t really included the sprayed edges (which are green. BRIGHT. GREEN! Omg!) but I’m sure you’ll see those floating around on Instagram. I love that it’s signed so much because Sara is one of my favourite authors and it’s not just a bookplate! I also love the art they included and the letter is super inspirational. TA-DAAAAA! Okay, so I just realised I forgot to include the book and those awesome goodies in this picture, but I can’t retake it and I refuse to postpone this unboxing yet again! Although I wouldn’t say this is my favourite out of the ones I’ve gotten, I’m still happy with all the goodies. Who can still say (s)he’s got a WAX SEAL?! And the bottle is just so a cool thing to include in a box! 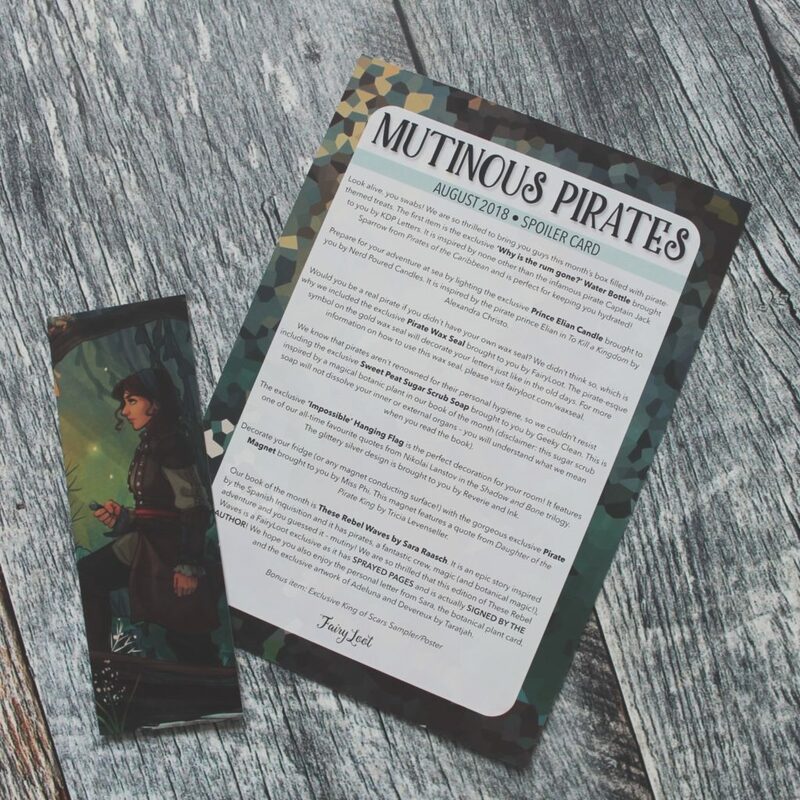 What do you guys think about the Mutinous Pirates Box? Did you get the box yourself? What’s your favourite item?